What is the Armenian EyeCare Project? 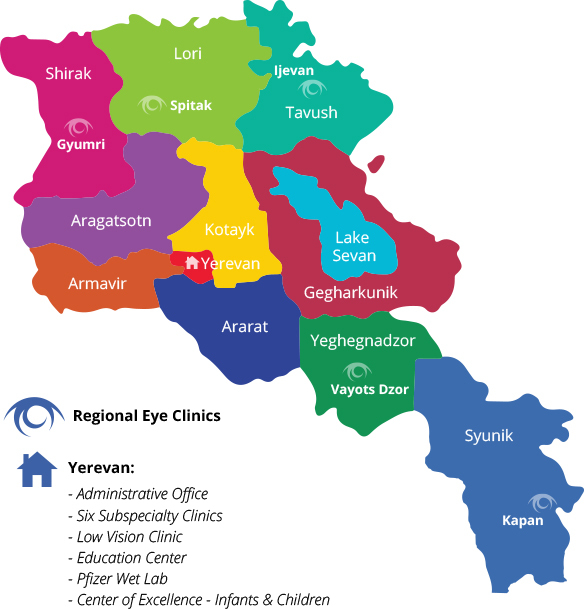 The Armenian EyeCare Project (AECP) is a nonprofit organization dedicated to providing people in Armenia quality eye care through five primary programs. The organization is governed by a volunteer board of directors and funded entirely with private dollars. What is the mission of the EyeCare Project? The mission of the AECP is to eliminate preventable blindness and its causes in Armenia and to make quality eye care accessible to every child and adult in the country. When was the EyeCare Project founded? The AECP was founded in 1992. Why was the EyeCare Project founded? The AECP was founded after Armenia’s Minister of Health, in late 1991, asked the international community for help in fighting a “growing wave of blindness in Armenia” and for assistance with the country’s serious health crisis. The desperate circumstances in Armenia were a result of a number of widespread factors, all occurring at the same time. In 1988, about 50,000 people perished and countless others were injured in a devastating earthquake; a six-year war between Azerbaijan and Armenia began, resulting in thousands of serious injuries; and 70 years of Soviet mismanagement had devastating effects on Armenia and its progress, especially when it came to medical care infrastructure, the embargos on the East and West, and a number of severe eye diseases and conditions not seen in other countries. In addition was the alarming rate of juvenile diabetes and diabetes-related conditions. Who founded the EyeCare Project? The Armenia EyeCare Project was founded by Roger V. Ohanesian, M.D., an ophthalmologist practicing in Orange County, California. Dr. Ohanesian attended medical school at the University of Vermont and did his ophthalmology residency and an ophthalmology fellowship at Harvard University Medical School, where he later taught. Dr. Ohanesian is very active professionally and in his volunteer and community activities. His many honors include the “Outstanding Service Award,” presented to him by the President of Armenia in 1993; the “Humanitarian of the Year Award,” presented by the Armenian Professional Society; and the “Outstanding Clinical Professor Award,” presented by the University of California at Irvine. What are EyeCare Project’s primary programs? The AECP has five primary programs: (1) direct patient care; (2) medical education and training, including on-site training in Armenia and U.S. ophthalmology fellowships; (3) public education and awareness; (4) research; and (5) strengthening the Armenian eye care delivery system through capacity building. What is the value of medication and medical equipment donated to Armenia by EyeCare Project? Since 1992, the AECP has donated over $20 million in medicines and medical equipment to Armenia because of the generosity of American pharmaceutical and medical manufacturing companies including Alcon, Allergan, Carl Zeiss Optical, Eye Technology and the $1 Million Pfizer Wet Lab donation in 2006. How many patients has EyeCare Project treated? Since 1992, the AECP has made over 50 medical missions to Armenia, has screened more than 500,000 patients in the country and performed over 20,000 surgeries. Who are EyeCare Project physicians and how are they selected? AECP physicians are selected based on their expertise and their sub-specialty. Most are highly trained academics with extensive experience in their specialty and in teaching, and are widely published. Many are department heads and professors from some of the most respected eye centers in the country, including Doheny Eye Institute at USC, Stanford, Duke, Rochester, and the University of California at Irvine. Prior to each mission, the needs of patients in Armenia are assessed and physicians are chosen who have ophthalmologic specialties that meet those needs. Armenia is located in an area called The Caucasus, a land bridge from Europe to Asia. It is a landlocked country, surrounded on the south by Iran, on the west by Turkey, on the east by Azerbaijan, and on the north by Georgia. It has been a Christian country surrounded almost entirely by Muslim neighbors since the dawn of these religions. How many people live in Armenia? Currently, about three million people live in Armenia. Its population has been declining the last several years, with particularly heavy emigration since its separation from the Soviet Union in the late ‘80s. With an estimated 60 percent of Armenians living outside of Armenia, there are more Armenians residing out of the country than in their mother land. About 5 million of the total 8 million Armenians worldwide live abroad; one million Armenians live in the United States. What is the literacy rate in Armenia? The literacy rate in Armenia is 99 percent, the highest in the world. This compares with 70 percent in the United States. An ophthalmologist is a medical doctor with advanced training in ophthalmology who is qualified to diagnose, treat, and manage all eye and visual system problems and diseases and is licensed by a state regulatory board to practice medicine and surgery. Ophthalmologists are medical doctors, with four years of medical school, one year of internship, and a minimum of three years of residency who are licensed to perform surgery and prescribe medications. Optometrists have four years of professional education at a college of optometry and earn an O.D. degree. They are licensed to diagnose and treat certain eye disorders and diseases and prescribe glasses and contact lenses. Opticians design, finish and fit glasses and contact lenses. How many people in the world are blind? Worldwide, approximately 38 million people are blind. About 90 percent of these people live in developing countries. The leading causes of blindness are glaucoma, macular degeneration, and cataracts. What are the leading causes of eye injuries? There are approximately one million eye injuries each year and almost all are preventable. Household injuries account for the majority of eye injuries. Sports injuries and fireworks are other leading causes. Diabetic retinopathy is a potentially blinding complication of diabetes that damages the eye’s retina. It affects half of all Americans diagnosed with diabetes. Age-related macular degeneration (AMD) is a disease that affects your central vision. It is a common cause of vision loss among people over the age of 60. Because only the center of your vision is usually affected, people rarely go blind from the disease. However, AMD can sometimes make it difficult to read, drive, or perform other daily activities that require fine, central vision. Glaucoma is a group of diseases that can lead to damage to the eye’s optic nerve and result in blindness. Open-angle glaucoma, the most common form of the disease, affects about three million Americans — half of whom don’t know they have it. There are no symptoms initially, however, over time you can go blind. With early treatment, you can often protect your eyes against serious vision loss and blindness. Uveitis is a general term that refers to inflammation or swelling of the eyes’ structures responsible for the blood supply. These structures are collectively known as the uveal tract, and include the iris, ciliary body, and choroid. Uveitis is classified by the structures it affects, the underlying cause, and whether it is chronic (lasting more than 6 weeks), or acute in nature. There are four main categories of uveitis. Anterior uveitis (also known as iritis) involves the iris and ciliary body and is the most common type; intermediate uveitis affects the ciliary body, vitreous and retina; posterior uveitis involves the retina, choroid and optic nerve; and diffuse uveitis affects structures both in the front and back of the eye. A cataract is a clouding of the eye’s lens that can cause vision problems. The most common type is related to aging. More than half of all Americans aged 65 and older have a cataract. In the early stages, stronger lighting and eyeglasses may lessen vision problems caused by cataracts. At a certain point, however, surgery may be needed to improve vision. Today, cataract surgery is safe and very effective. How can I contact the Armenian EyeCare Project in the United States? How can I contact the Armenian EyeCare Project in Armenia?